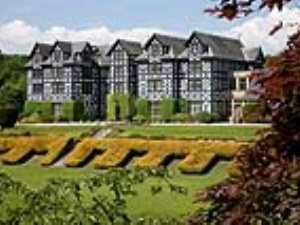 Courtyard B & B @ Gregynog Hall01686 650224work Guest AccommodationGregynog Hall has accommodation available for up to 101 people (sharing) with 56 bedrooms, including 14 traditional en-suite, and a further 6 bedrooms in a cottage nearby. Our rooms are of varying sizes and styles, from grand historic rooms to single study bedrooms. All rooms have tea and coffee making facilities, with wash basin, towels and toiletries. The 36 bedrooms of the Main Hall have fabulous views of the grounds, share the original 1920s bathroom facilities and are often graced by original works of art and fine furniture. In the historic stable yard, 12 modern en-suite bedrooms have been created, comprising five single rooms, six twin rooms and one family room. Two further en-suite rooms are fully equipped for wheelchair use. Gregynog Hall has accommodation available for up to 101 people (sharing) with 56 bedrooms, including 14 traditional en-suite, and a further 6 bedrooms in a cottage nearby. Our rooms are of varying sizes and styles, from grand historic rooms to single study bedrooms.